Have you found an online vendor selling A. H. Riise Non Plus Ultra Very Rare? In der Nase wie ein süsses Karamell-Vanille-Lakritze Shampoo. Im Gaumen fast zu süss, wie ganzer Jahrmarkt-Süssigkeiten Stand im Mund. Fruchtspiess mit Zuckerwatte auf Vanillecreme mit Karamellsauce und extra Zuckersirup und Schokostreusel. Für Süssholzraspler, Freunde und Geniesser des süssen Rum. In the nose like a sweet caramel-vanilla-liquorice shampoo. Almost too sweet on the palate, like whole fair sweets stand in the mouth. Fruit skewer with cotton candy on vanilla cream with caramel sauce and extra sugar syrup and chocolate sprinkles. For fawners, friends and connoisseurs of sweet rum. Tastes like one of those chocolate pralines that you feared of getting in your mouth when the box was almost empty. The flask though is probably one of the most beautiful I've seen. If you're a fan of those horrible pralines you will probably love this one. it´s a little bit to sweet , with an icecube it´s a little bit less sweet. Taste - Great : very sweet ,very rich, long and fruity ,sherry ,caramel , vanilla ,smoke,tabacco. If you like sweet Rum , you must try this one. Best Riise I have ever had, but I can't give it full score, because it isn't very good value for money. XO Reserve is very similar in taste but it is also 50% cheaper. If money is not a problem for you, than this is defitnitely must have. If you want to have something little but worse but for much less money, than XO should be your choice. Beautiful bottle, but a glas - plastic combination to close the bottle. It looks like a cristal caraffe. I smell caramel, tabaco, toffey, vanilla. Then caramel again, sweet, vanilla, wood, and long lasting coffee and toffey. Really long lasting. But it sweet. You will love it or hate it. I love it! Not my cup of coffee. For sweet candy lovers. Smells nice, nice dark color. I cannot decide if I dislike it or hate it. The flavor is like whole candy dissolving in your mouth at once. Great bottle though, you can boast before your friends but don't pour them a glass, they will think you have more money than brains. The bottle looks old and fansy. The rum is amazing. Heavy toffe and caramel. Rich taste and smooth to drink. Get one and try for yourself. because of the price and bottle presentation I expected at least the perfect quality of quorhum30. first thing you notice is very strong smell after dried orange.Then you take first shot, and what you can feel, is very significant taste and afterburn of, yes, dried orange. 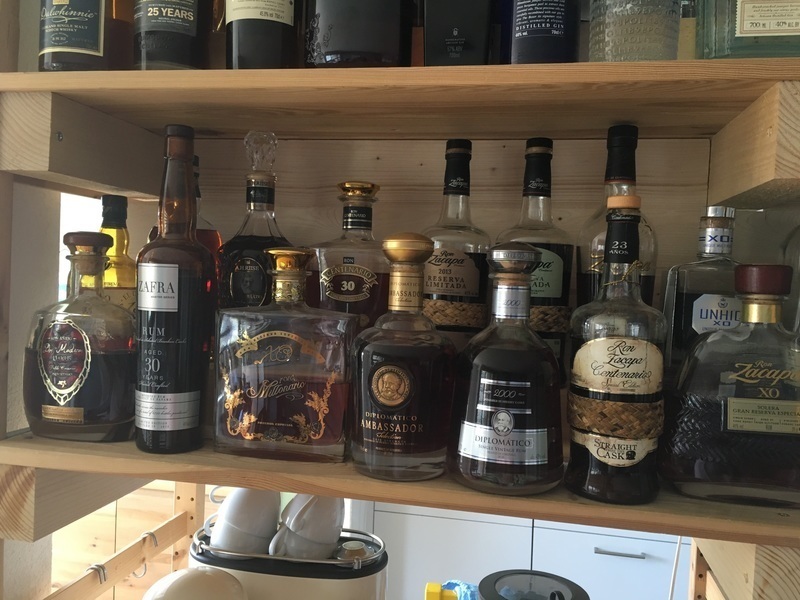 smell and taste are very different from all the others rums in my cabinet. One reviewer here wrote that this is not even a rum and I didn't understand. now I understand,it's significant and specific smell & taste makes you think about this is not a rum. But I came across a bottle in a small low profile bar in Zürich... 24 Swiss Francs for 4cl I thought : " Sure ! Let's do it !!! ". Well I m glad I did. At first the smell was so horrible I thought somehow it went bad...A bit like the Mocambo I rated to be the worst Rum ever made. Then I take a sip, and... woooooooooooooooooooooooooow! Never had something breathtaking in my mouth (I m a straight male). Don t want to spoil it for you guys so do yourself a favor. Get your hand on a bottle or order a glass of it if you can find it. The experience totally justifies the price you pay for it. The taste is Non Plus Ultra a unique experience, with its very rich, long and fruity flavor with hints of cedar, Vanilla, Caramel, fine Sherry and Seville Orange, which continues almost indefinitely, and ends of with an elegant soft finish. I bought this bottle, in the very beginning of my rum adventures. I got sold on some great promotion and salesmanship, and the flashy decanter. Boy did I regret that. This just is not rum. No information on whats in the bottle, but I can tell you, that if there is any rum in there, it has been diluted with all sorts of weird added flavors and obviously colouring. It tastes like hystericly sweet candy, with odd non natural flavors. Sød og til dels rund rom med frugtig duft. Sødmen og den til dels små parfumerede smag og duft bliver dog hurtigt for meget. Et godt glas som altid kan drikkes, men ikke pengene værd. Prisudviklingen er dog også gået fra 900 til 600kr. You can love it or hate it. Nothing in between. For me its love. Excellent sweet rum. This rum is provided in a nice and classy bottle which shows you that you are in the premium range of the brand. I have been told that one of the caracteristic of the brand was the presence of orange taste in their products and it is sadly clearly true. The Orange taste predominate others aromas like caramal, vanilla and even the sherry. Clearly a premium product but it does not match my taste. Sweet with a lotof sherry body, it is not far away from Dos Maderas 10+5 years. After tasted the XO Reserve, I was curious to taste this rum. The bottle is maybe one the most beautiful if you forgot the Angostura Legacy and the Havana Maximo. But my fear was that the predominant aroma of orange will always be present in it. And it was the case ! This one is more complex with oak, leather, citrus, tobacco. Long and fruity flavors in mouth with vanilla and caramel. If you study the history of this company, you can understand the aromatic orientation for this product. But if you closed your eyes, you can recognize a syrup for the throat. I recognize the quality of work behind this blend but I do not approve the aromatic choice. Diversity creates wealth and rum universe is vast. Nepochybně je hladší, kořeněnější, s delším dokončením než jejich standardní. Na druhou stranu, stejně jako ony je hlavně výrazně sladký, což ty nuance poněkud přebíjí, takže v poměru cena/výkon udělají např. X.O. 175 years Anniversary nebo Family Reserve přece jen lepší službu. This is a top class rum. Very smooth and long taste. Also a great aftertaste. The bottle is gorgeous, the glass structure... the rum inside is golden brown. The feel is sweet, you taste vanilla and cherry, in the nose some citrus tone, orange and caramel. Afterburn and aftertaste is so fine.